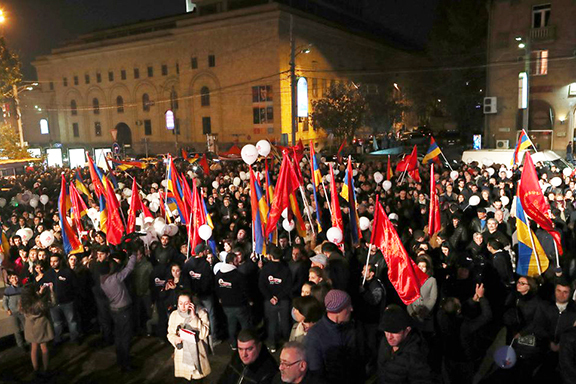 YEREVAN (ARF Press Office)—The Armenian Revolutionary Federation officially kicked off its parliamentary election campaign on at a rally near the statue of Aram Manukian, the founder of the Republic of Armenia in 1918, with the slogan “Faithful to our land and to Armenians”. Gegham Manukyan, a candidate of the ARF proportional and district list, mentioned in his speech that the campaign kickoff began at Aram Manukian’s statue to always remain accountable to Aram Manukian, who founded this republic 100 years ago. “Today, the ARF uses the same ideological principles and continues to say, that the ARF is faithful to the land and to Armenians: that land which is a portion of land that in 1915 Aram Manukian defended in Van (Western Armenia), that land, whose other portion, Artsakh, was protected by the fedayees, and another portion of land, that is called Javakhk. The land that we dream about must be protected” said Manukyan. He also mentioned that these elections are different due to a very important circumstance, which is the hope that the elections will pass in a correct manner, without corruption of money. But, Manukyan also noted in his speech that these elections have one critical issue: Will they pass based on discussions of programmes and ideologies? “We are calling on all political parties and alliances formed for these elections, starting from Prime Minister Pashinyan to the newly formed political parties, ‘participate in the election campaigns by presenting your programs and ideologies. Do not only use the people’s movement as a flag in order to move forward.’ That will make us approach a dangerous line, which is called a red line,” said Manukyan. “Today is the first day of the campaign, ‘My Step’ alliance member Sasun Mikayelyan gave himself permission to categorize the April-May people’s movement more important than the movement that started a few decades ago, a powerful national liberation struggle, that we call Artsakh. Sasun Mikayelyan either did not understand what he was saying or was trying to belittle the Artsakh heroic battles. Certainly, he can justify by saying he has participated in the Artsakh liberation war, but many have taken part in the volunteer activities starting with the former president of the Yerkrapah Volunteer Union to the volunteers. But the important thing is to keep that spirit. Let’s hope that Sasun Mikayelyan did not understand what he said. Because it’s time to move forward with principles and ideologies,” concluded Manukyan. Rustamyan went on to say that the ARF Dashnaktsutyun is participating in these important elections because Armenia, which is in a critical transition period, faces serious dangers and challenges. The main danger is not to become a new, well-forgotten old repetition or a new packaging of the past. The danger is real, because for all types of political parties, and the current regime is not an exception, the temptation is always great – to come to power and to gain their own power, replacing old political and economic monopolies with new ones. There are already signs of this. Although it is announced that all promises have been completed, the super-prime ministerial system of government has not been eliminated yet. Moreover, there is no guarantee that it will not be replaced by a super-presidential system.” The same faces remain, but it is announced that there are no longer any oligarchs, maybe due to the reason that they have already become their own, remarked Rustamyan. In the economic sphere, the same subjects have maintained their dominant positions, but it turns out that there are no monopolies anymore, perhaps because they demonstrate the willingness to serve the new government officials, continued Rustamyan. “Finally, we have seen from the ’90s, how it is possible to manipulate over 80 percent of the people by exploiting the people’s confidence to serve their own power, deviate from national goals and dissipate the national awakening and standing in danger of losing Artsakh’s victory. We have no right to take our people through the same trials and tribulations. That is why the ARF decided to participate in these elections. The main challenges are to go from a conscious rejection to success. “That, which has existed as a fact until today, is, in essence, an actual change of the regime, but not a full-fledged revolution. The revolution is still ahead. The revolution does not begin with the coming of power, it begins after the coming of power. The revolution will be complete when positive shifts will be felt in everybody’s everyday life, when no poor Armenian will remain in our country, when people will be appointed using a system of relative, -acquaintance-friend will be appointed not from the scope of the MDP, but will be appointed for their merit, capabilities, and abilities to do work. When will we have a truly just Armenia? “During the past elections, it was not by chance that the ARF participated using the slogan ‘New beginning, just Armenia’. The new beginning was put based on the new parliamentary system, and the first attempt was successful. Immediately after transitioning to the parliamentary system, the bloodless change of the prime minister took place, which was truly unprecedented in our newly independent history. It remains to us that this new beginning brings us to a just Armenia. It is due to that, the ARF decided to participate in these elections. The ARF will participate in the elections in accordance with its national, socialist, democratic and revolutionary principles and mission. We remain faithful to our enduring and endless values. Faithful to the land and to Armenians,” concluded Rustamyan. ARF Supreme Council of Armenia representative Arsen Hambartsumyan noted during his speech that a principle of the campaign is that the ARF will win. And the slogan is unique to every ARF members essence. “Our goal is to build a fair and powerful country for a free citizen. Build a free, independent and united Armenia. The ARF stands for the preservation of national values, without the development of concessions and social justice, “he emphasized, noting that the upcoming elections will predetermine the future of the country’s development. “The forces participating in the elections are old and new, they are in your view. Compare and you will see that Dashnaktsutyun differs from everyone because we are not a party of one person, we have ideological and programmatic principles. We have never been interchangeable and we will never be because we have not said one thing and then another. We are an independent political force, “said Hambardzumyan, hinting that internal and external forces have tried to influence the Dashnaktsutyun, but that did not succeed and will not succeed because Dashnaktsutyun has one master, the Armenian people. According to him, the stronger the ARF will be correlated with how fair and peaceful we are as a country. “We must develop without compromising, this should become reality,” said the ARF Supreme Council representative. Former Minister of Agriculture and ARF parliamentarian candidate Artur Khachatryan made a speech. He noted that the ARF is a unique political party and essentially differs from other political structures, not only because it has branches in Armenia, Artsakh, and in the diaspora, which has been with the people for 128 years, but also because the socio-economic picture of the party, The ideology is leftist – socialist. “We believe that the state plays an essential role in ensuring the country’s economic development. We do not believe that the market’s own hand can handle the market, to create a prosperous, just society, a society where everyone will get his merits and investment. We find that a state cannot sit with its arms foled, that a state has a very important role to develop the country.” stated Khachatryan. He also mentioned that the development of the country for the ARF is as equally important as social justice. According to Khachatryan, social justice is meant to distribute the social value created by the members of the society. According to him, the people do not complain only of poverty, hard social conditions, but the main complaint of the people is injustice. Khachatryan said “Tens of thousands of people are working day by day, but they get coins, and oligarchs, who are called the owners, pocket a significant part of their national value. And this principled position stems from our socio-economic policy. We demand progressive development, inclusive growth, social justice and sustainable development. We attach a crucial role to the state in the rapid economic growth. the state must take the role of the locomotive of economic development from the passive regulation, actively eradicate market failures, crises”. Khachatryan continued stating, the state should be able to create jobs in state-private companies in the format of state-private partnership. If a private company is not being enticed to open jobs, the state must fill that gap in those areas where the private is afraid to enter. The ARF member noted that the value created by the state should be distributed equally: currently people work, but they do not get their share of the income. “The fruits of economic growth are not fairly distributed. We have pensioners, unemployed people who receive salaries, people are have been working their entire lives, but their pensions do not even guarantee the basic necessities. Is that what we want? Of course not. We are talking about a solid society and we must guarantee that solidarity with our economic policies. Today’s society should also create the basis for the well-being of future generations, we must conduct the right health and educational policy. Today’s generation is also responsible for future generations, “said Khachatryan. Armenuhi Kyureghyan, an ARF candidate for parliamentarian, touched upon the social programs of the ARF. According to her, the ARF considers one of the priorities of the social state as a requirement of a dignified life of every citizen. But,Gyureghyan noted that what is the current government offering? – a government who instead of creating jobs is threatening people with a loss of job if they do not vote. “We have a proposal to increase the role of the state in the workplace, instead of unemployment, to create jobs. The ARF considers that the social state is obliged to have a job creation program for each citizen. Programs that will provide young people with jobs after the education system will include programs aimed at providing disabled people with jobs in quota, programs aimed at addressing key demographic issues, implementing measures to promote the birth of the next child, promoting immigration and preventing emigration, enhancing pensions and benefits “said Kyureghyan. According to Kyureghyan, the people’s vote and confidence are needed to implement those programs. Kyureghyan mentioned that they have always talked about the necessity of changing the governance system and despite having few mandates [parliamentarians] in the National Assembly and a few employees in the government were able to achieve that systematic change. “By receiving more votes, we will definitely be able to implement social justice in the country, to contribute to the formation of a social state. Trust the ARF, the party that has never said something and done something else, and a party who is always consistent in moving ahead with its plans. Look at our lists and compare with other lists. We have a party that has included all the members of the government on its list as there are no other people. Look at their list and you will see that the same incapable team, who can not do anything today and instead of going out of the campaign through its programs, has come out of a black and white struggle since there is nothing to propose, “Kyureghyan said, adding that ARF offers specific programs and concrete solutions and a powerful team that will achieve all that. 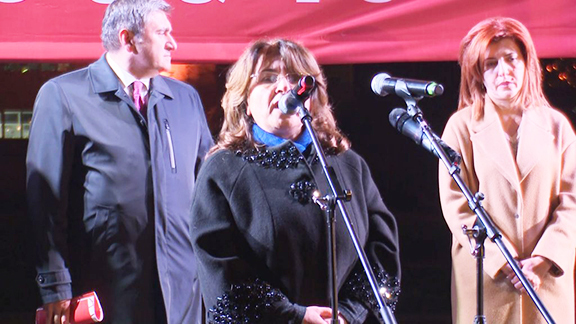 Artsvik Minasyan, a candidate of the ARF parliamentarian proportional list, told those gathered at the campaign launched at Aram Manukyan’s statue, why they should elect Dashnaktsutyun. First, the ARF has a clear plan from the socio-economic to the nation, which is based on a clear-value system. “Show at least 2 parties that meet this criterion. You will not find it, do not waste your time. Parties are created around the person and do not see the future of Armenia’s development. Secondly, ARF is not a party gathered around a person, but it is about the idea and is responsible. And thirdly, the ARF is a party that has come to existence of the people’s nation, born from the suffering of the nation. It is a people’s party, a party that is fighting against perversion and devastation of the traditional Armenian family. And finally, ARF is every Armenian. Confidence in the ARF is a trust in our powerful country, a dignified Armenian, “Minasyan said. He emphasized that they would say openly what they did to prevent bloodshed in the country from the 90s to the last days. “We will openly state what the ARF Dashnaktsutyun has done to prevents Armenians from fighting Armenians on March 1st,” ARF member said. At the end of the rally, the ARF youth organization (ARF- Youth Organization of Armenia) members performed a flash mob with torches depicting the initials of ARF in Armenian.